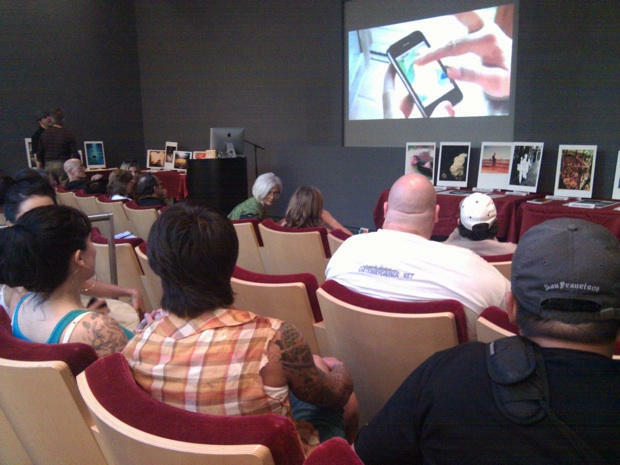 A view of the iPhone Photo exhibit in San Francisco's downtown Apple Store. You have until midnight, October 6 to enter your best iPhone snaps to be part of a traveling exhibit of the best in iPhone Photography. Winners will be showcased in Apple stores around the US — Chicago (Oct. 21), New York’s Soho Store (Oct. 29) and in Santa Monica (Nov. 11). Your best shots must be done on an iPhone, unaltered and family friendly (this is retail, people). Cult of Mac checked out the San Francisco Apple Store event — and it didn’t disappoint. Held upstairs in the theater, there was a range diverse work from photogs and videos interviews where they told how they got started as iPhone photographers and how they go about it. If you’re at all interested in iPhone photography, the shows are worth checking out. Experienced photographers like Christian Peacock were on hand to chat and give advice, it’s definitely a share-and-share alike kind of community. You can get all the details about entering the upcoming shows from organizer/iPhone shutterbug Knox Bronson at Pixels–The Art of the iPhone website.